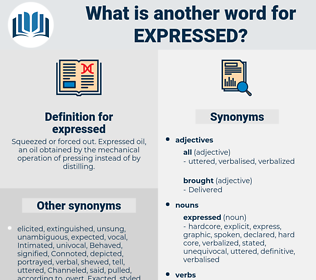 What is another word for expressed? Squeezed or forced out. Expressed oil, an oil obtained by the mechanical operation of pressing instead of by distilling. expressions, concerns, representations, Gestures, participants, stakeholders, statements, remarks, indications, views, overtures, Guidelines, discussions. Existed, stressed, proposed, demonstrated, Explained, address, addressed, Reiterated, Congratulated, reaffirmed, exposed, Praised, acknowledged, appreciated, explicit, Assessed, extended, Testified, Ceased, represented, asserted, experienced, representative, criticized, confessed, discovered, pronounced, Protested, conveyed, understood, characterized, opposed, characterised, proclaimed, Deplored, measure, supported, Responded, ascertained, considered, thanks, Thanked, Prosecuted, Regretted, Issued, issues, Wrote, illustrated, Manifested, Contemplated, endorsed, reflected, underscored, presented, observed, affirmed, circulated, specified, aroused, representation, Indicated, Communicated, recognized, distributed, Exhibited, exhibits, Replied, repeated, proved, confirmed, suggested, commend, Commended, assured, hailed, summarized, Delivered, S, promised, crossed, Rendered, Performed, Expounded, emphasized, Forwarded, reversed, uttered, emphasised, self-identify, prepared, Referred, recorded, pledged, Passed, approved, Offered, Applauded, identified, recalled, institutions, condemned, liked, implemented, exchanged, description, parliament, Served, Discussed, relationship, Appeared, members, Ushered, attest, voiced, celebrated, constituted, Hoped, hopes, revealed, imposed, published, reminded, registered, rose, Urged, desired, posed, assumed, informed, reacted, ruled, Stipulated, showed, Enshrined, felt, underlined, determined, sent, accepted, shared, Greeted, directed, transmitted, Seemed, Told, Displayed, displays, formulated, advised, agreed, Wished, concluded, Wondered, saw, Pleaded, Pled, Proceeded, Helped, ambassador, Instituted, learned, regarding, Regarded, realized, Echoed, echoes, briefed, struck, ensured, Promoted, used, seminars, Scored, Agencies, Argued, Concurred, Mentioned, Contributed, labeled, labelled, defined, credited, note, noted, announced, Reached, With, disclosed, gathered, Emerged, Termed, develop, developed, estimated, Submitted, Appealed, delegation, Answered, Began, Generated, Defended, implied, Undertook, opinion, Cited, ended, clarified, paid, Worked, produced, received, visible, Warned, lamented, started, included, aired, relayed, covered, set, Influenced, Arrived, Upheld, Introduced, encouraged, Intimated, Resulted, Embraced, Incurred, Questioned, formulation, Provided, adopted, donated, Towards, established, Garnered, alleged, heard, member, Cried, recommended, Clients, posted, Signaled, signalled, seminar, sought, released, Filed, moved, memorandum, part, involved, conceded, highlighted, strongly, Rated, initiated, taught, in, valued, Drafted, outlined, elicited, increased, invited, committed, Enunciated, treated, Contended, Insisted, broadcasts, satisfied, improved, notice, noticed, know, Remained, applied, engaged, communication, left, comment, Asked, marked, Followed, added, attached, broke, Gordon, turned, placed, Occurred, Believed, contained, Caused, staged, Created, required, pointed, emit, Deemed, Voted, Viewed, Achieved, completed, Quoted, granted, joined, advanced, Objected, appointed, Visited, decided, Your, Became, signed, Grew, Entered, elaborated, lifted, morocco, listed, OJ, come, Came, Stood, Aimed, needed, hosted, Mooted, requested, drew, form, formed, Obtained, held, Brought, views, footnote, Walked, maintained, Notified, on, mission, advice, Attracted, Allowed, Had, Vowed, lf, Yielded, Approached, led, Awarded, format, Looked, Totalled, Talked, party, Parties, table, tabled, Returned, unveiled, focused, continued, continuing, Threw, Marched, Met, Launched, Went, convicted, Meant, fell, figured, Ran, Than, wanted, 21, thought, conducted, called, Acted, Gained, Happened, formula, Accounted, Amounted, tried, 'd, won, cut, 'il, dated, made, Gave, signify. pressed, professed, Existed, Progressed, preferred, stressed, proposed, demonstrated, reservations, Explained, addressed, Exerted, Reiterated, Congratulated, operationalized, reaffirmed, exposed, Praised, Exercised, inspired, acknowledged, Participated, appreciated, processed, explicit, Assessed, extended, incorporated, represented, Expelled, perceived, asserted, Persons, Persuaded, experienced, observations, Exemplified, representative, Translated, discovered, pronounced, Spurred, expected, Protested, conveyed, understood, characterized, opposed, characterised, measured, Deplored, supported, Responded, transcribed, ascertained, considered, interpreted, Thanked, materialised, Prosecuted, subscribed, pursued, altered, written, Regretted, provoked, Issued, illustrated, respected, Manifested, harassed, endorsed, reflected, recognised, underscored, presented, Seconded, observed, publicized, affirmed, prescribed, circulated, specified, aroused, Indicated, Communicated, foreseen, proven, guaranteed, Espoused, recognized, distributed, resolved, Exhibited, Replied, repeated, Materialized, proved, confirmed, suggested, Commended, assured, preoccupied, Phrased, hailed, poster, summarized, Delivered, S, Feared, promised, crossed, Rendered, Performed, dismissed, Expounded, emphasized, Forwarded, spelled, emphasised, prepared, evaluated, interrogated, Referred, recorded, pledged, Passed, approved, Offered, sparked, identified, recalled, condemned, liked, implemented, formalised, parliament, Served, complimented, Discussed, Disseminated, predicted, bothered, Appeared, advertised, voiced, risen, Hoped, revealed, renewed, Prevailed, Compared, imposed, Originated, published, reminded, witnessed, registered, Diverged, Urged, desired, Enumerated, posed, assumed, formalized, Borne, supposed, verified, informed, spread, reacted, Shown, ruled, Engendered, acquired, certified, lent, showed, associated, relieved, regrettable, Enshrined, rejected, signified, felt, designated, underlined, Denounced, determined, sent, accepted, derived, stimulated, shared, manifesto, Greeted, directed, transmitted, inscribed, seen, Told, Surveyed, Displayed, formulated, advised, Advocated, Computed, agreed, Wished, concluded, esteemed, briefing, convinced, Pleaded, accomplished, Helped, replaced, Radiated, Favoured, learned, Regarded, instructed, realized, retained, Echoed, trained, Resumed, i.e., Arisen, ensured, Promoted, classified, used, Scored, seized, apportioned, pleased, opened, opening, Argued, Mentioned, Contributed, authorized, spent, settled, labeled, labelled, evoked, favourable, Evinced, defined, credited, note, noted, announced, conspicuous, Enjoyed, triggered, encrypted, printed, reviewed, Denominated, quantified, Reached, Sentenced, disclosed, gathered, Emerged, Termed, Undertaken, developed, estimated, Submitted, anticipated, Captured, Answered, Generated, checked, Defended, opinion, Cited, clarified, paid, Worked, produced, received, included, aired, sustained, covered, set, divided, Influenced, Targeted, accompanied, Upheld, Introduced, encouraged, Resulted, worried, Embraced, Incurred, Questioned, appropriated, Provided, adopted, donated, enquired, Devised, established, detected, projected, ground, alleged, heard, COSTED, scheduled, Worded, discharged, member, Caught, read, allocated, recommended, posted, Signaled, signalled, sought, converted, preferable, Consigned, released, Filed, moved, memorandum, involved, vehicle, affected, highlighted, Rated, initiated, Supplied, referenced, designed, participants, valued, Drafted, outlined, located, dedicated, detailed, elicited, employed, forecast, increased, Relied, invited, enrolled, Undergone, committed, broadcast, troubled, Afforded, Enunciated, Championed, framed, treated, known, Contended, Insisted, satisfied, improved, Levelled, obliged, comments, notice, noticed, applied, engaged, kept, Prompted, left, Asked, marked, devoted, added, Judged, collected, placed, interviewed, qualified, Benefited, benefitted, Tackled, Occurred, Challenged, dumped, Believed, thereon, featured, contained, linked, Delegated, fixed, Caused, Emitted, intended, vented, point, Created, Lodged, required, pointed, Demanded, Subjected, Deemed, Voted, Viewed, Achieved, Consulted, completed, Quoted, granted, become, advanced, assisted, appointed, Visited, decided, guided, Encountered, signed, Grew, Entered, elaborated, documented, lifted, listed, drawn, planned, come, Aimed, hosted, laid, requested, formed, worn, Obtained, held, Brought, tagged, maintained, Couched, Notified, mandated, advice, Attracted, Allowed, Had, evidenced, attended, Yielded, Approached, led, Awarded, Accorded, Flagged, Looked, Talked, tabled, taken, Returned, aligned, backed, headed, focused, continued, handed, gone, Met, Launched, funded, Dealt, Meant, shed, wanted, 21, thought, conducted, called, based, founded, Gained, Happened, done, Accounted, tried, won, dated, made, named. 've, From, Into, Of, a., convey, demonstrate, voice, say, declare, show, offer, give, Gave, raise, state, signify, lend, denote, air. I fear it, and yet can hardly part with one, so dear to me is thy affection in whatever way expressed. Nor was it only suffering that his face expressed.